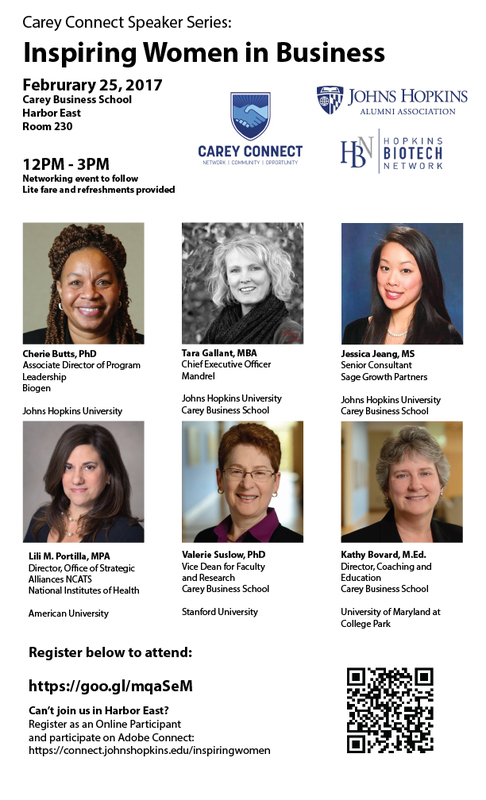 Carey Connect, the Johns Hopkins Alumni Association, and Hopkins Biotech Network are hosting an Inspiring Women in Business speaker panel. Please join us to hear from women leaders in Biotech, Health Administration, Education, and Consulting. After the panelists share their experiences there will be a networking event with lite fare and beverages. All proceeds from the event will go toward Dress for Success, an organization that empowers women to achieve financial success. In collaboration with Carey Connect and Johns Hopkins Alumni Association. Be sure to connect with them and attend this event in-person or using the live stream.